Our book club recently read The Boys in the Boat by Daniel James Brown. If you read only a handful of books this year, please put it at the top of your list. It is non-fiction at its finest, filled with facts, yet reads like story. Daniel Brown tells the story of the University of Washington’s men’s crew team competing in the 1936 Berlin Olympics. The story starts long before Berlin, with 9 boys coming together in Seattle, when the city was barely establishing itself. The story of Joe, the main character is heart-breaking and inspiring. With little support, or hardly a family to call his own, he begins to row at the University of Washington. Joe’s story is an incredible tale of tenacity and overcoming adversity. Brown explains the technicalities of rowing in such simple rich language that you will be enveloped and enthralled as you read. As Hitler is rising to power and putting a gleaming sheen on Germany for the entire world to see; these humble boys come and fight for the Gold, with every ounce of strength they have. 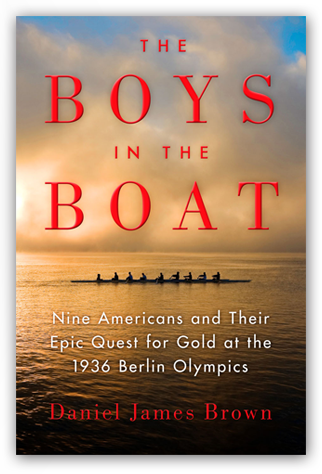 The Boys in the Boat is rich with World War II history, Seattle history, and the thrill of competition. If you liked stories like Rudy, Hoosiers, or Cinderella Man, you will love this book. Put it in your top 5 for the year. The audiobook is fantastic.